What is the concentrate adapter? Switch from herbs to extract in just a few seconds. The adapter allows users to enjoy high quality flavorful vapor from extracted oils. This is not your traditional dab rig, it will not vaporize all your concentrate in 5 seconds. The Crave concentrate adapter is specifically designed to slowly release the vapor allowing for better flavor profiles and longer lasting hits. To fill the concentrate adapter, open the cover of the concentrate canister, place a little bit of concentrate/wax/shatter at the bottom of the tank right between the air-holes, but making sure no wax goes inside the air-holes. Next, close the lid and insert back into the Crave Air oven. 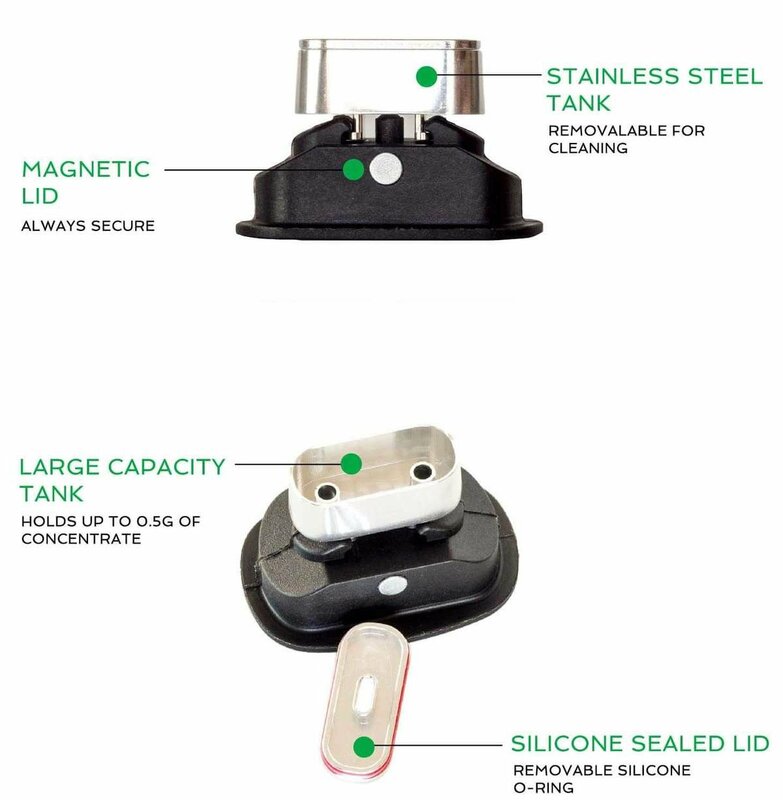 The concentrate insert is held in place magnetically and is now ready to use. Next, click the power button to turn the Crave, and set it to the highest temperature. Once the LEDs are green, it is time to vape. Note: Its best practice to remove the adapter from the oven while still warm. Regular cleaning of the Concentrate adapter is required to ensure maximum flavor and efficiency. Remove the Stainless steel tank from the plastic lid/holder. Simply slide it off. Open the lid of the stainless steel tank and remove the silicone O-ring from the outside of the lid. Collect the 2 stainless steel parts and submerge in iso-alcohol for 15-20mins or until the tank is clean. Rinse with water and replace the O-ring.